← Coastal Magic Convention 2017 Schedule! Our special guest joining us today for coffee and crafts by the beach is another “Featured Author” for the upcoming Coastal Magic Convention, Kiernan Kelly. I’m so excited she accepted my invitation to join us today. Kiernan’s a very gifted author and crafter and has come up with a very special craft project to share with us later. For now, let me tell you a little about this creative lady. Kiernan Kelly lives in Florida among the alligators and palmetto bugs with her husband and a Shar Pei-Labrador puppy who thinks she’s a person (the dog, not Kiernan. Kiernan knows she’s a person. At least, she is after she’s had her daily dose of caffeine). You can also find Kiernan on the brand spanking new Evil Plot Bunny website. Today is it’s debut so be sure to go by and check it out. Last chance to get your ticket for the full weekend is January 20th. Kiernan shows us her contribution in the three-person project she and fellow Club Raven authors, BA Tortuga and Julia Talbot are creating to be raffled off for charity at Coastal Magic this February. BA Tortuga and Julia Talbot will be joining me later this week with their contributions. I can’t wait to see what they do. 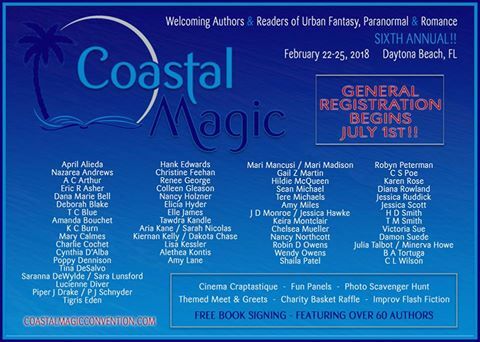 Don’t miss your chance to meet over 50 fabulous urban fantasy, paranormal, and romance authors at Coastal Magic next February! This super casual book-lover weekend happens on Daytona Beach and gives everyone the chance to hang out with fellow readers and amazing storytellers. Thanks for joining us today, Kiernan. I look forward to seeing you in Daytona come February. What do you do with the swag you get from conventions and book signings? Have you ever used them in a craft? Please feel free to leave a comment and a picture of anything you’ve made with some of your author swag.